Is an Automated Gate System Right for My Home? So you’re considering having an automated gate system installed in your driveway. But have you taken the time to think about all the pros and cons? The truth is, there are a ton of reasons why anyone should consider an automated gate system. 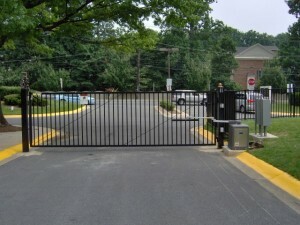 Hercules Fence of Richmond would love to help you design and install the automated gate that’s right for you. Keep reading to find out the numerous benefits of adding an automated gate system to your home. Hercules Fence of Richmond would love to help you design and install the automated gate system that’s right for you. Many thieves choose their victims based on how easy a target you are. Think about this: if you have a security gate and your neighbor does not, whose home is more likely to be broken into? Entry into your property can be via transmitters, pushbutton, touchpad, touchpad with intercom, dedicated phoneline connection, or swipe card. Safety is provided by metal detection loops, photo eyes, and/or metal detecting gate edges. You can even have your cell phone ring every time someone enters your driveway! Let Hercules Fence of Richmond install a beautiful automated gate system with an artistic flair and great aesthetic appeal. Adding a driveway gate is a great way to boost your curb appeal and keep your property looking great! And don’t forget, along with curb appeal comes an increase in property value. Often, insurance companies will give discounted rates to homeowners who take extra security precautions such as having an automated gate system installed. Insurers know that homes are less likely to be broken into when your property is more secure. Keep your children and pets safely inside your yard and know that no one can just stroll right in, as you control who enters your property. Along with predators, keep out pushy solicitors and any prying eyes – after all, what you do on your own property is your own business! Considering having an automated gate system installed on your home property? Get in touch with Hercules Fence of Richmond, VA today! This entry was posted on Wednesday, July 15th, 2015 at 5:33 pm. Both comments and pings are currently closed.